It’s that time of year again, YES! TIME FOR CMJ! We have partnered up with the lovely people of The Deli Magazine to present some amazing dates! See the map to a good time above! Also peep our round up of all the indie bands you love before they get huge! Rub shoulders with artists, celebs, industry folks, college kids, and all the New York hipsters. This is your guide to everything cool in NYC this week, this is the guide of your life for the next 5 days. Featuring Six60, Die! Die! Die!, Ghost Wave, Popstrangers , Lawrence Arabia and Tom Lark. Kick off CMJ Music Marathon with Conveyor, Eli Mardock, Natureboy, Pree and The City and Horses. Take a spin to win a SCHWINN bike, sip on free drinks, and snag bike bells, vinyl, and more. Performances by Union Street Preservation Society, Dust Engineers, Shakey Graves, Plume Giant, JP and the Gilberts and XNY. Performances include Braids, Maus Haus, Blackbird Blackbird, Team Spirit, Solid Gold, Filligar, Triple Hex, Zulu Pearls, The Bowery Riots, Jon Derosa, Wooden Indian Burial Ground and Correatown. Performances (in order of set) by Impose DJ Set, Wild International, Win Win, Michna, Flume, Jerome, Mykki Bianco, Prince Rama, and Pictureplane. Arrive early to grab a free Terrorbird tote bag and free PBR! Free with RSVP. More info. Performances by The Virgins, The Neighbourhood, Indians, Goldroom and a special secret guest. 10:30am-5:30pm (Bands begin every other hour). Performances (in order of set) by Turtle Giant, DIIV, Little Green Cars and Poor Moon. Electronic stage (upstairs) is free. Performances by Thomas Simon,Sewing Machines, Cultfever, Railbird, Maus Haus, Lushlife, Anomie Belle, Ducky and Drop Electric. 12pm-6pm (First set at 1:20pm). Performances by Hot Panda, The Intelligence, The Orwells, Rah Rah, San Cisco, Turbo Fruits, Twerps, Blessed Feathers, Dikta, Elephant Stone, Skipping Girl Vinegar, Tim Chaisson, and The Trouble with Templeton. Performances by Death Grips, DIIV, Joey Bada$$, Holy Other, Metz, Merchandise, Daughn Gibson, Hundred Waters, LE1F and Angel Haze. Two hundred priority tickets will be given away at the Topman store, located at 478 Broadway in SoHo, on Wednesday and Thursday between 10am and 9pm. 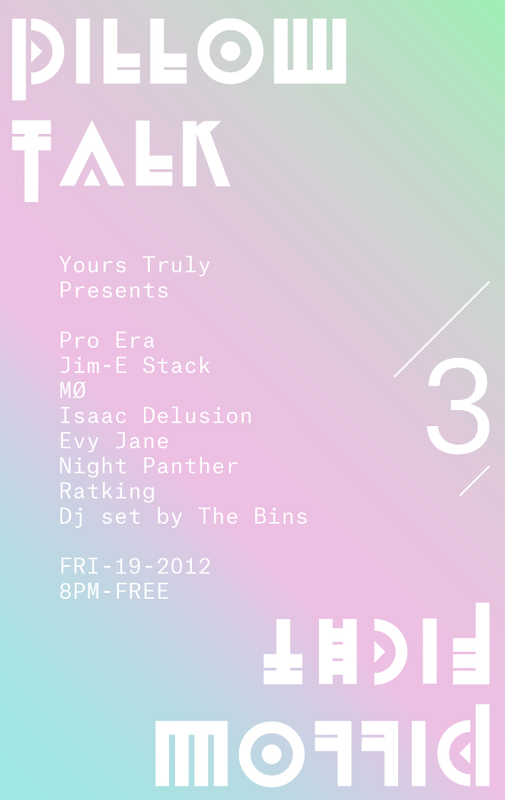 Performances by Pro Era, Ratking, Jim E-Stack, Isaac Delusion, Evy Jane, Night Panther and MØ. Performances by Kung Fu Crimewave, St. Lenox, Mal Blum, Bird to Prey (CD Release), Go Love, Ben Pagano Band and Crazy & the Brains. Performances (in set order) by Vockah Redu, Daytona, Dent May, Delicate Steve and Heavenly Beat.